Happy New Year, deals fans! This week we have been scouring the top online shopping sites looking for discounts on tech and gadgets and have found a wide range of bargains to save you some money. 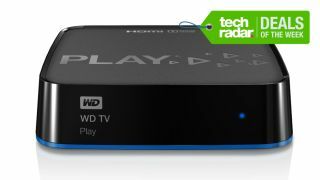 The top deal this week is a Western Digital WD TV Play Media Player that works with almost any HDTV. And at 49% off, it's an absolute bargain for only £32.99. Simply plug it into a spare HDMI port and this little box gives you access to services such as Netflix, YouTube, Spotify and more on your HDTV. Not only that but it will stream files off your home PCs in a wide variety of formats and has a USB port for connecting hard drives, digital cameras and camcorders. It also has built-in Wi-Fi for easy set up and also packs an Ethernet port for those of you who prefer to keep things wired. As ever, there are plenty more deals listed below from the biggest internet retailers so, if your TV is already a smart one, take a look at these and hopefully you can save some cash on your next tech purchase.